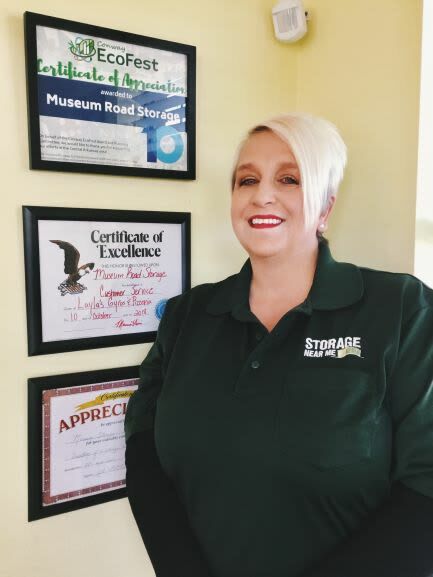 Christina Pickett has been the manager of our Museum Road Storage location for 2 1/2 years. Her hard work and commitment to excellence has earned her the admiration of the facilities owners, her co-workers, and many customers. Over that period of time, she has turned a struggling facility into a thriving business, and her hard work is being recognized. Recently, she received an Excellent Customer Service Award from Layla's Gyros and Pizzeria, an Appreciation Award from Conway EcoFest, as well as an Appreciation Award from the City of Hope Outreach Program. Thank you, Christina, for all of your hard work!